Part 2 of 4 in a series of blog posts about Standards-Based Grading. We all learn about backwards planning in teacher’s college; for a given unit, that means you start by creating the unit test (deciding what are the most important skills & topics to evaluate) and then building learning & assessment activities that build towards that unit test appropriately. And this makes all the sense in the world. But then the real world of teaching smacks you in the face; three new courses to prep, very little free time what with all the extra-curriculars, etc. you’re helping with . . . all of a sudden it’s all you can do to prep something for the next day’s lessons, let alone backwards plan your entire unit for each of your courses. The Assessment Plan (AP) brings us back to this idea of backwards planning. We use the AP to plan the number of evaluation tasks & tests we will have in a semester and to outline which of the overall expectations (OEs) and achievement chart categories (K/U, App, T&I, Comm) that the test covers. The intent is to have a variety of task types that cover a variety of OEs and categories. If your AP is a good one, there should be no gaps in OEs evaluated or in the categories that they incorporate. The AP is broken into two sections of columns; the first section lists all of the Overall Expectations, divided into their strands, while the second section lists the category expectations (K/U, App, T&I, Comm). Each row represents an evaluation task or test. 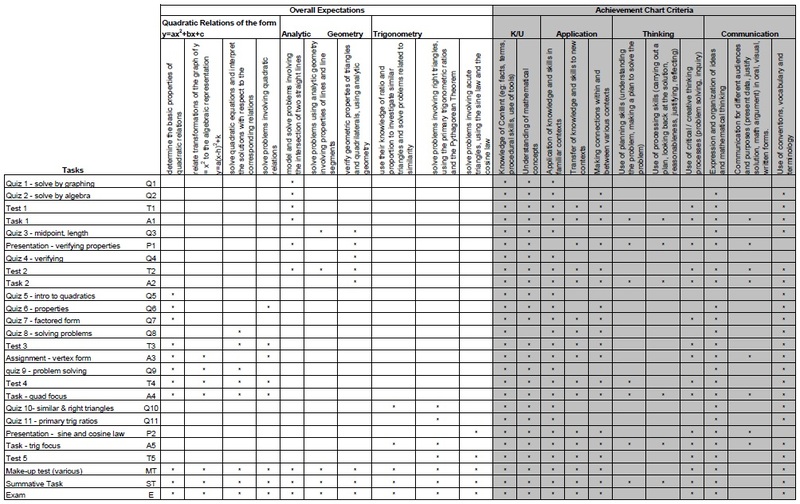 The left-most column is where you write the title of your evaluation tool (ie. “Quiz 1 – solve by graphing”). There are checkmarks for each of the OEs that are being evaluated by that tool, and also each of the category expectations that are built into the tool. For example, let’s look at “Test 3” in the above AP. The title of the test is written in the first column along with the code “T3” which will be used to record marks on each student’s evidence record. Then there are symbols, in this case *, marking which of the OEs are covered on the test. So this test 3 covered 3 out of the 4 overall expectations in the first strand. We can see the 3 *s under the OEs. We can also see that this test incorporated all of the Knowledge & Understanding (K/U) and Application category expectations as well as some of the Thinking and Communication expectations. What we can easily see is that each of the overall expectations is evaluated more than once over the course of the semester and that all of the category expectations have been met across the span of the course as well. Homework: Here is my suggestion for the best way to practice using an assessment plan before next September. Pick one course that you are currently teaching and feel most comfortable in. Go to http://ocdsb.elearningontario.ca and sign in using the same username & password you use to sign on to any OCDSB computer. Under “Teacher Resources” on the right hand side of the page, click on “Secondary Assessment Plan templates by Subject”. From there you will click on the folder for your subject area and click on the AP for your course. The AP will open in a viewing window. Click on the download button in the bottom right-hand corner to save the file to your own computer – and from there you can open the file, edit the file, and print a copy. I suggest you print out a copy. Fill it out with the quizzes, tests, & tasks that you have been using so far this semester for that course; anything for which you recorded a mark in your mark-book. Start by listing the tests/tasks in chronological order down that left-hand column. Next, check off the OEs that it touched on as well as the categories that it touched on. If you need a refresher on the OEs or categories for your course have a read through your curriculum documents. I can’t emphasize enough how you need to be intimately familiar with your curriculum documents. Have you checked off each of the overall expectations at least once? If not, which ones are missing? What sort of test/task could you add in order to evaluate them? If so, have you provided multiple opportunities for each overall expectation? How can you build your tests/tasks so that student have more than one chance to provide you with evidence of their learning on a particular OE? Have you checked off each of the achievement chart categories at least once? If not, which ones are missing? How could you modify/amend your tests/tasks to incorporate them all. Alternatively, what sort of test/task could you add in order to touch on those that have been missed? Don’t panic if you notice big gaps in your assessment plan’s checkmarks. This is the time to notice the gaps and work to fill them in. The AP is a handy a tool to help you ensure that you have a well-balanced set of evaluation tools which will allow your students to provide the best evidence possible of their learning across the expectations of your course. Next up: Creating tests/tasks & the rubrics to go with them.